First the researchers gathered information about the colour and intensity of different parts of the lizard's tongue using a portable spectrophotometer to measure the tongues of thirteen skinks. The first exciting finding was that the blue tongue is actually a UV-blue tongue. The researchers then established that the rear of the skinks' tongues was almost twice as bright as the tips. 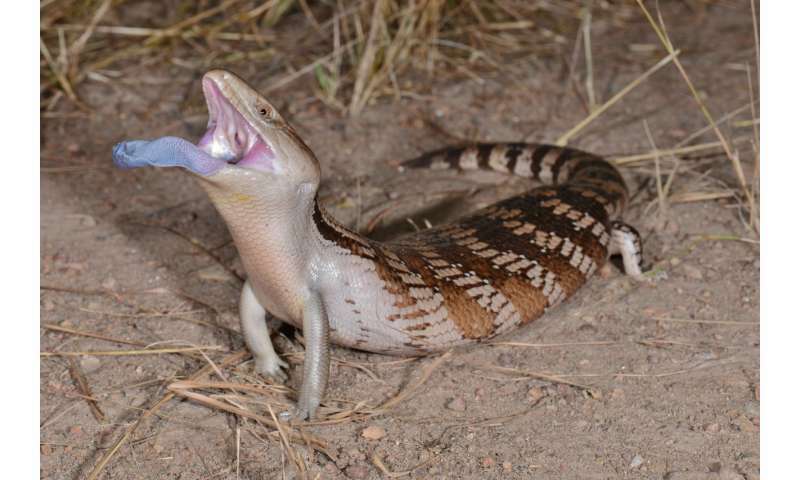 When a predator approached, the skinks would remain camouflaged until the very last moment, before opening their mouths widely and revealing their highly conspicuous UV-blue tongues. The next part of the study involved simulating 'attacks' on these lizards using model (fake) predators. The team used a snake, a bird, a goanna (monitor lizard), a fox and a piece of wood as a control. The model predator attacks were simulated within a controlled environment. "The lizards restrict the use of full-tongue displays to the final stages of a predation sequence when they are most at risk, and do so in concert with aggressive defensive behaviours that amplify the display, such as hissing or inflating their bodies", explains lead author Arnaud Badiane. "This type of display might be particularly effective against aerial predators, for which an interrupted attack would not be easily resumed due to loss of inertia." "The timing of their tongue display is crucial," adds Badiane. "If performed too early, a display may break the lizard's camouflage and attract unwanted attention by predators and increase predation risk. If performed too late, it may not deter predators."